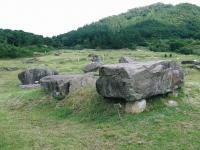 The Gochang, Hwasun, and Ganghwa Dolmen Sites are groups of megalithic funerary and ritual monuments. A dolmen is a kind of tomb, or prehistoric cemetery. They can be found all over the world, but Korea is said to have 40% of the world's total on its grounds. The numerous ones included here were constructed around the 1st millennium BC. 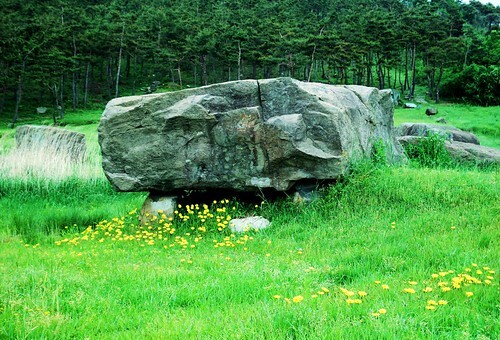 The dolmens in Ganghwa are the earliest ones, of the northern, table-shaped type. They include the biggest stone of this kind in South-Korea, measuring 2.6 x 7.1 x 5.5 meters. Of these Korean dolmen sites, I only visited the big one at Ganghwa Island (near Seoul). No entrance fee there, though the dolmen is placed in a little park and there is the ubiquitous soft drink vending machine. To simply get there, and to enjoy the Ganghwa landscape was the most interesting part of my visit. 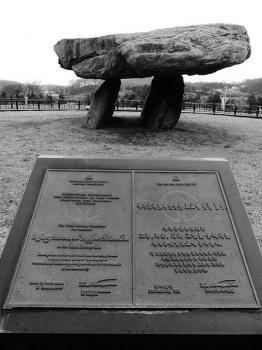 The dolmen itself is "just" 3 stones put on top of each other. I have seen those before in Holland. But I have good memories of visiting this site, because it was the 7th and last worldheritage I saw on my trip to Korea. As this one is quite out of the way and was not included in my original travel plans, I am glad that I was able to visit it after all. I visited this WHS in April 2017. I only visited the sites in Ganghwa Island closest to Seoul but after a number of video documentaries (the best one for an overview is https://m.youtube.com/watch?v=6osPwzl5OIE) and from information from the Ganghwa History Museum I visited (just opposite the dolmen park in Ganghwa), I would only visit the other sites if I were passing by the area as their only difference is the sheer amount scattered on the hill sides. First of all let me explain how I got to the Ganghwa Dolmen Park and the other minor sites on Ganghwa island. By subway I got to Sinchon "Bus Terminal" (Exit 4). From there my suggestion would be to forget the misleading title "Bus Terminal" and without crossing the road simply look for the first lamp post with a bright red sticker showing Bus 3000. That is where you'll have to wait for the 90-minutes bus ride to the main town of Ganghwa-eup. A printscreen with the name in Korean and a picture will help the bus driver know where you want to go. Once you get on the island from Ganghwa-eup Bus Station, head to the small tourist information booth and ask for information to the Bugeun-ri Dolmen Site (20 minute bus ride). The friendly staff will write down the bus number for you as well as the platform number and departure time. Once you get to the largest dolmen in Korea you can follow a 2km hiking trail to the minor Jeomgol Dolmen, and further on to Chunguk Samgeori but this one is not on the UNESCO list. One bus stop before arriving to Bugeun-ri (free entrance by the way! ), you can hike to the Osang-ri dolmens but you won't get anything better than the large one in the dolmen park (photo). The UNESCO inscription certificate plaque is just in front of it too. The dolmen is lit up and accessible at night if you happen to have a rental car and be in the area. The Ganghwa History Museum (closed on Mondays) is worth visiting mostly for the few remains and the informative models illustrating the most plausible methods of how the dolmens were built. Having visited quite a number of prehistoric sites myself, I wasn't impressed by this WHS as there are no temple structures or apparent alignments (like in Carnac for example). The large dolmen is very similar to the one in The Burren in Ireland and so I failed to appreciate its OUV. Nonetheless, I'm glad I visited by public transport as a taxi ride would have cost me an arm and a leg! 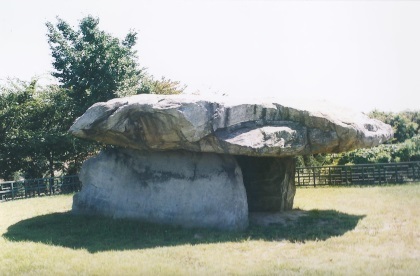 The Gochang, Hwasun and Ganghwa Dolmen Sites are locations for hundreds of dolmens used as graves and for ritual ceremonies. Most of these megalithic structures are dating from the period of the first millennium BCE. According to specialists, Korea contains more than 40% of the world's dolmen. The site located on Gangwha Island is the easier most convenient one to visit from Seoul. From the Sinchon bus Terminal, take a bus to get to Gangwha Island bus terminal in one and a half hour and from there, take another bus to move on the island. However, the dolmen are scattered throughout the island and it is difficult to see most of them and to have a general view. A notable dolmen on Ganghwa Island's site is a kind of table-type dolmen where it was believed ancestral rites were performed. 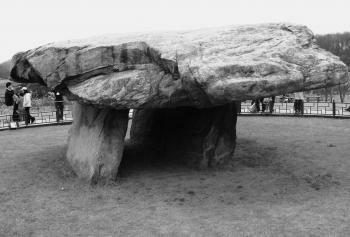 This dolmen is thought to be the biggest in Korea. The main thing that struck me was how delicate this structure looked despite the massive size of its capstone, it was perched like a delicate Brancusi sulpture. Ganghwa island is littered with megaliths and if you really were keen this would be a good place to go exploring, apparently it is one of the densest concentrations in the world. As for me, I was here just to see the big one, which is now in a well-manicured park which does contain another standing stone (also part of the WHS). My visit was a little brief as the weather wasn’t so nice, but the warm welcome and free cup of coffee from the friendly information centre kept me going. There is also a pretty new local history museum next door, but it was closed on the day I visited (Monday). There are regular buses from Ganghwa bus station; just asking for ‘Goindol’ got me on the right bus. I wouldn’t say this would be most people’s highlight of Korea, but it was a nice place to head to on a quiet, slow and slightly gloomy day, it helped me recharge my batteries to gear me up for the delights of Seoul. I have now visited all three WHS listed dolmen sites in Korea and consider the Gochang site to be the most interesting. There I saw a whole mountainside dotted with 128 dolmen of several different styles. Altogether there are around 2000 dolmen on this district. The visitor centre at the dolmen site is served by a bus from Gochang town, which in turn has bus connections with Jongeup and Janseong, both stations on the Mokpo railway line. The Hwasun dolmen I reached from Neungju railway station, and the Ganghwa site by bus from the Sincheon bus station in Seoul. These pre-historic dolmens site are just as fascinating as some of those found in the UK or France. Not as spectacular as Stonehenge or some of the other stone circles in the UK, but altogether impressive if at the very least by the sheer number of them. The largest dolmen is located on Ganghwa Island, which is only about an hour or so from Seoul. Some of the best preserved and largest clusters are found in Gochang in the Southwest. 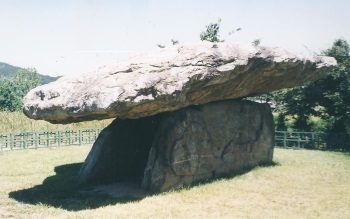 There are three different styles of dolmens. The major dolmen at Gangwha is by far the most impressive. Yet, the other dolmens on the island are often collapsed or difficult to locate. Gochang has the largest concentration of dolmens perhaps anywhere in the world. Most Gochang dolmens are table-top style and are found spread out over a broad hill. Many look like boulders, but on closer inspection you can see they are placed on two or four small rocks. There is an excellent small museum at the Gochang site just completed in 2010. I visited some of the Ganghwa dolmen sites in 2008 and I visited the major Gochang dolmen cluster in 2011. I was most awed by the Ganghwa dolmen, but as far as visitor experience Gochang holds the greatest value. Will anyone venture to the Hwasun Dolmen cluster? Perhaps on my next visit, as I explore the nearby Unjusa Temple. A caveat in choosing Gochang is that Gochang County is a UNESCO Biosphere Reserve. This reserve includes the dolmens, Gochang Fortress, Gochang Tidal Flat, Ungok Wetland, and Seonunsan Provincial Park. Choosing Gochang means 1 WHS, 1 TWHS, 1 UNESCO Biosphere Reserve, and 2 Ramsar Wetlands! Perhaps one of the most unique and beautiful counties in Korea. 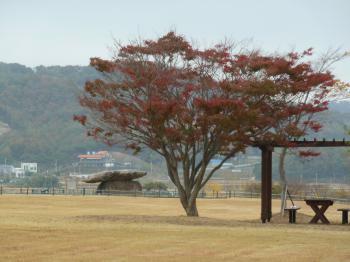 I visited the dolmen site in Ganghwa Island in Jan. 1, 2010. It is an ideal day trip for those based in Seoul. The earliest bus from Sinchon station is at 5:40 a.m. and the trip will take about an hour and a half. There are many things to see in Ganghwa. Apart from the dolmen sites, I also visited fortresses (overlooking the sea) and a palace. Be sure to check the bus schedule as they are quite few. It was cold when I went and waiting for buses going back to the terminal or to other locations in the island took at least 30 mins each time. It was really a wonderful experience visiting the Hwasun megaliths in December, 2007. As a person studied widely, the megaliths from India, I find the Hwasun megalithis really amazing. They are huge and impressive. I feel we need to make a comparative study of the Korean and Indian megaliths. In india also we have cup-marks on megaliths. I am happy that the site is well protected and maintained. First of all the Ganghwa dolmen are spread all across on a mountain park and you have to go through a steep climb to get there and to reach the park you need to go through a small village through the island but it was an incredible world heritage site. Stone Quarries: "They also preserve important evidence of how the stones were quarried, transported, and raised..... Hwasun Dolmen Site ...In a number of cases the stone outcrops from which the stones making up the dolmens were quarried can be identified." Built in the 7th century BC: The Chungnim-ri group in Gochang is considered to date from around the 7th century BC. Dolmen construction ceased here in the 3rd century BC. The Hwasun dolmens are a little later, from the 6th-5th centuries BC. There are insufficient data to permit dating of the Ganghwa group, but they are thought to be earlier rather than later. Global Geoparks: Mudeungsan Area (2018) includes the Hwasun Dolmen Site.